Personal brand…you’ve likely heard or seen the phrase, but may not realize the impact it can have on both your personal life and your professional career. Taking care of your personal brand, and nurturing it can make the difference in getting that next promotion or new job. My friend Diane Diaz joins me to discuss the impact your personal brand can have on you and why we need to care about how we use social media. I had a lot of fun talking with Diane and I hope you’ll tune in and see how you can shape your own brand story and be the best brand ambassador for yourself! Diane Diaz is a self-proclaimed brand geek, Certified Personal Brand Strategist and Social Branding Analyst, and a CultureTalk Certified Partner in using Archetypes in personal branding and team building. 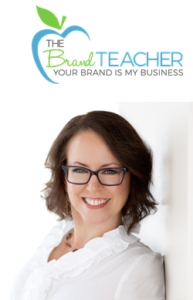 She uses her two decades of combined branding and teaching experience to teach professionals and entrepreneurs how to unleash the power of their personal brands. Her passion for branding is combined with 15 years working in the corporate world, 9 years of which was spent leading the marketing and branding efforts for two award-winning residential communities, and supported by a BS in marketing from University of West Florida and an MBA from University of Central Florida. In addition to running her business, The Brand Teacher, Diane has been teaching branding and marketing classes at Full Sail University for the past nine years. Diane works with her clients to help them define their unique personal brands so that their online presence matches their in person presence and helps them attract their right fit jobs or clients. She also leads workshops with companies and organizations in using Archetypes to better understand each team member’s drivers, motivators, work style, and more to develop stronger employees and better functioning teams. We also mentioned Episode 001 with Mike Taylor, so if you haven’t had a listen in – we suggest you do! I’d be honoured if you liked this episode, if you would be kind enough to like and share the episode with your friends and colleagues. We use the hashtag #theloungepodcast on all LinkedIn, Twitter and Facebook. I’d also appreciate a rating and review over on iTunes. You can subscribe there as well and make it easy to get every episode as they are released. Subscribe on iTunes.